The March on Rome is often cited as the beginning of Italian fascism. However, there was a fair amount of a run-up to the actual blackshirt invasion of the capital. Right-wing violence ravaged the Italian provinces for years before the actual march and, when Mussolini came to power, he formed a coalition government with conservative liberals and Catholics. In the coming years, Italy’s liberal democracy would be gradually dismantled. Nevertheless, the march was a turning point, and it introduced fascist elements into the Italian governmental leadership. 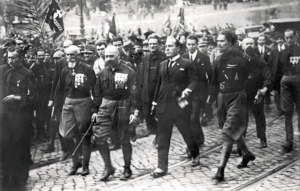 113 Italian Fascism Part Two, What is Fascism, Anyway?